Wetlands range from ponds to rivers, reedbeds to bogs, and are home to a large diversity of plants and animals.� However, they are not just important for biodiversity. Wetlands improve water quality by removing and sequestering pollutants and sediments in the water. Wetlands are of high importance to fisheries. Over two thirds of the world’s fish harvest is linked to the health of coastal and inland wetland areas. �Wetlands may be of high importance to agriculture and timber production, through the maintenance of water tables and nutrient retention in floodplains. Wetlands store floodwaters, acting like natural sponges and slowing down the force of flood and storm waters as they travel downstream. Far from posing a flood threat, wetlands should be viewed as buffers, to protect areas where people live (Anonymous 2008d). Wetlands may provide important energy resources, such as peat and plant matter. Wetlands may be of value to transport, recreation and tourism. Wetlands offer habitat for wildlife.� Many migratory birds and other wildlife depend on the ecological setting of wetlands for their survival. Wetlands support biodiversity.� The variety of living organisms found in wetlands contributes to the health of our planet and our own lives possible by ensuring our food supply, regulating the atmosphere and providing raw materials for industry and medicine. Wetlands provide valuable open space and create wonderful recreational opportunities.� Hiking, fishing, boating and bird watching are just a few of the activities people can enjoy in wetland areas.� The scenic vistas of wetlands make them an ideal area for nature photographers or painters. Wetlands are vital in preventing further climate change by acting as a store of carbon.� Until recently this has not been fully appreciated, and in Ireland it has still not been adequately communicated to the general public. 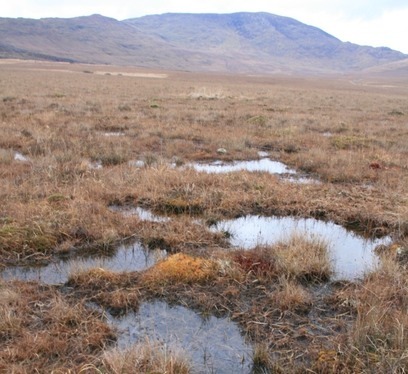 For example, peatlands are known to store 20-30% of the worlds soil carbon exceeding by three times the amounts stored in tropical rainforests (Bragg and Lindsay 2003). These functions, values and attributes can only be maintained if the ecological processes of wetlands are allowed to continue functioning.� Unfortunately, and in spite of important progress made in recent decades, wetlands continue to be among the world’s most threatened ecosystems, owing mainly to ongoing drainage, conversion, pollution, and over-exploitation of their resources. Putting an economic value on something as abstract as the ecological services of a wetland is a difficult idea for most people, but is becoming a more accepted economic tool.� More commonly, the open market puts monetary values on society's goods and services.� In the case of wetlands, there is no direct market for services such as clean water, maintenance of biodiversity, and flood control.� There is, however, a growing recognition that such natural benefits do have real economic value and that these values need to be included in decision-making processes. In a recent report by the Biodiversity Unit of the Department of the Environment, Heritage and Local Government (Anonymous 2008d) the biodiversity value of wetlands in Ireland was estimated to be worth €385 million per year to the Irish economy.� In addition a further proportion of the €330 million assigned by this study to the economic value of the nature and eco-tourism value of all Irish habitats can be assigned to wetlands. One other stark fact to emerge from this report was that “it is clear that the benefits of biodiversity far exceed the costs of the current levels of biodiversity protection” in Ireland, an indication that we still do not value the functions and services provided by wetlands to our well being as a society. Numerous other reports exist in the literature that gives clear examples of the economic value of wetlands.� The UK Environment Agency has a wealth of literature showing the value of intact functioning wetlands in the control and alleviation of flooding episodes (Anonymous 2008d).� In addition a number of reports exist which show that intact wetland systems provide excellent value for money in the provision of water services when compared to the costs that would accrue if these services had to be supplied by artificial systems.� An illustration is the example from the USA where the State of New York purchased a watershed area at a cost of 1.5 billion dollars, rather than spend 3 to 8 billion dollars it estimated it would cost for artificial waste water treatment facilities to do the same job (Anonymous 2008d). Unfortunately, to date, society has generally only realized the benefit of wetland services after they have disappeared or been seriously degraded.� Problems with flooding, lost recreational opportunities, reduced fish populations and more costly water treatment are examples of costs understood only after a wetland ecosystem has been degraded or destroyed. The idea behind putting an economic value on some of these wetland benefits before ecosystem-altering decisions are made is to recognize these potential costs up front and thereby put wetland-related decisions on a more economically sound footing.